MS Spitsbergen was built to serve as a car and passenger ferry in Portugal in 2009, but due to financial crisis its original owners never took delivery of it and it languished, occasionally changing hands, for seven years -- not once sailing. 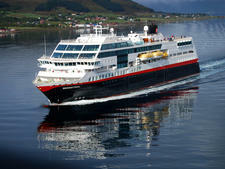 Then in 2015, Hurtigruten decided to turn another ship in its fleet -- Midnatsol -- into one of its "Explorer" ships, thus taking it out of service from September to May. The line needed a replacement fast. It would take too long to build one, so they decided to buy this ship and turn it into a cruise ship. After a massive refurbishment, which saw cabins installed, the restaurant remodeled and car decks turned into passenger and crew decks, MS Spitsbergen entered service in June 2016. As a result, it feels new, with contemporary classic Scandi blonde wood fittings throughout, light carpets and modern fittings. Spitsbergen is small -- just 280 passengers (290 at double capacity), with one restaurant, one bistro/cafe, one bar and one observation lounge. But, it's ideal for navigating the narrow fjords along the Norwegian coast, which it does from September to May, calling in at 34 ports on a 1,250-nautical-mile journey from Bergen to Kirkenes. It is also not a "traditional" cruise ship -- there is no cruise director, Broadway-style entertainment, pool parties, cinema or musicians playing in lounges. In fact, there is no entertainment at all, bar the daily port lectures; the action goes on outside, whether that's watching a pod of orcas swim past, jumping into warm clothes and rushing out to observe the northern lights or gazing up at a night sky untainted by any light pollution. There is also a plethora of shore excursions offered along the way. Speaking of the northern lights -- special mention must be made to this -- it's one of the main reasons people take this cruise. And, if you are travelling at the right time of year, the chances are you will spot them, even if it's just a hazy green in the night sky. Hurtigruten has a button, "Northern Lights Info," on all its ships by the bed that you can choose to keep on and an announcement will be made at any time -- day or night -- telling you the lights have appeared (it's always fun to see people running outside in varied states of sleepy, cameras at the ready). 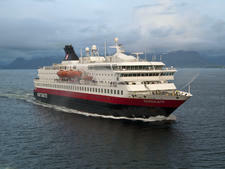 In fact, Hurtigruten is so confident you will see the aurora borealis on your 11-night journey, there is even a Northern Lights Promise -- if you don't see them when sailing between October 1 and March 31, you'll be invited back for a free six- or seven-night cruise the following year during these same dates. Back onboard there is one aspect of the ship that is as good as or better than you might find on a traditional cruise ship, and that's dining. There may be only one dining room onboard Spitsbergen, but the food is of exceptional quality. Hurtigruten make a virtue of its cuisine, always sourcing ultra-locally (usually from the port you've just pulled away from) and supporting local farmers and fisherman, so it's always fresh. There's also a wide variety of food -- even if some of it you may have never heard of. The cabins are comfortable and contemporary (all Scandi wood and framed photos of Spitsbergen's ports of call), with big picture windows and modern bathrooms with lovely products. 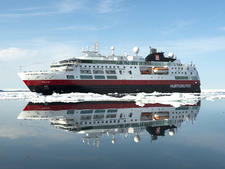 Overall, Spitsbergen is a small, well-designed, comfortable ship that is ideal for the regions it cruises. And, it's clearly popular -- it won Cruise Critic U.K.'s Best Small Ship category in the 2018 U.K. Cruisers' Choice Awards. The type of passengers onboard depends on the time of the year. From September to May the ship operates the full Norwegian Coastal Voyage, starting in Bergen and ending up in Kirkenes, stopping in 34 ports along the way and serving the local population, who jump on and off at different points. You'll get Norwegians who live along the coast using the ship as a ferry, while the other passengers will be on for the whole voyage -- all 11 nights round trip from Bergen. From May to September, the ship operates under the line's "Explorer" brand and operates traditional cruises to Iceland, Greenland, the Faroe Islands, Svalbard and Spitsbergen. On these expedition voyages, expect to meet a more international crowd than on the coastal voyages, with a mix of fellow explorers from the U.S., U.K., Scandinavia, Germany and other European countries, as well as Oceania and Asia. All will have a common wish to explore, engage and interact. "Arctic casual" is the name of the game, with anything that keeps you warm and dry in the winter and protected from the sun in the summer. There is no dinner dress code onboard. There are three fare types with different inclusions. Basic includes accommodation and full-board dining only. Select adds internet, tea and coffee. Platinum also includes a drinks package with dinner, a la carte breakfast, two shore excursions and airport transfers, as well as some other fun inclusions like a visit to the bridge to meet the captain. Tipping is not customary in Norway, and tips are not part of your fare. You'll find a tips box at the restaurant with an envelope if you wish to tip. The currency onboard is the Norwegian krone (NOK). Norway's 1,250-mile coast attracts traditional cruise passengers to a Nordnorge voyage. Meanwhile, young European backpackers use the ship as a means of transportation between towns. 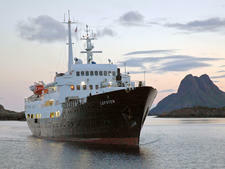 MS Lofoten, named after the island chain off the northern Norway coast, was one of the last ships designed for Hurtigruten as a break-bulk cargo passenger ship. 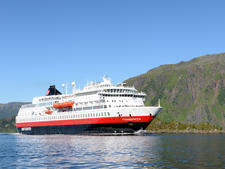 Trollfjord joined Hurtigruten in 2002 and is one of the most modern ships in the fleet. 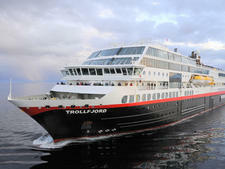 Trollfjord sails Baltic Sea voyages year round from Bergen. 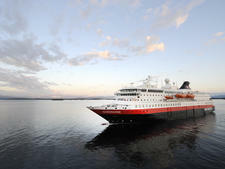 Polarlys, built in 1996, sails voyages that explore Norway's coastal communities and stunning fjords as part of Hurtigruten's fleet of "Contemporary Ships." 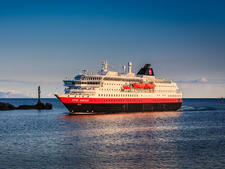 One of Hurtigruten's six "Contemporary Ships," Nordlys sails voyages that explore Norway's coastal communities and fjords. Full cruise passengers are primarily 50-plus and European. 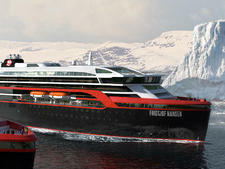 Finnmarken is just one of four vessels in Hurtigruten's fleet to be built in the 21st century. It carries cruisers along with cargo along Norway's coast. Nordkapp, meaning North Cape, links Bergen to some 35 ports along the Norwegian coast as far north as Kirkenes, a mining town near the Russian border. 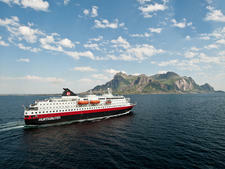 Kong Harald is the first of Hurtigruten's ships to have undergone a total ship refurbishment. The line hopes the refreshed look will attract a younger crowd. Like the rest of Hurtigruten's Norwegian coastal fleet, Richard With is a working ship that makes calls around the clock, picking up passengers and goods. 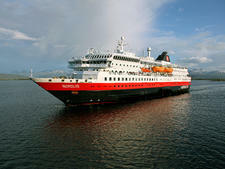 Hurtigruten's Vesteralen was built in 1983 and overhauled in 1995. 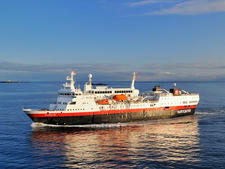 The vessels sails Scandanavian itineraries, focusing on the spectacular Norwegian Fjords and offering regional cuisine. Midnatsol is a luxury cruise ship, cargo vessel, car and passenger ferry, and expedition vessel. It sails year-round up and down the west coast of Norway. 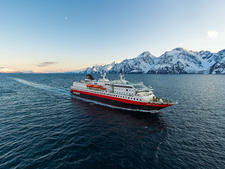 Fram was designed for expedition cruises to some of the most remote places on the planet. The ship spends ample time in Arctic waters. 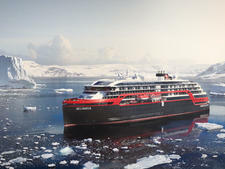 MS Fridtjof Nansen is the second of Hurtigruten’s new hybrid powered expedition ships, which is scheduled to launch in 2019. The first is MS Roald Amundsen, which is scheduled to launch in May 2019.